Each time I see a Cirque du Soleil show, I’m transported. Cirque shows are truly magical experiences that can’t help but leave the viewer feeling a little bit transformed. For those of you who’ve not yet experienced a Cirque du Soleil show, it can be a bit hard to define. Each performance tells a story through the combination of acrobatics, dance, music, lighting and elaborate costumes. 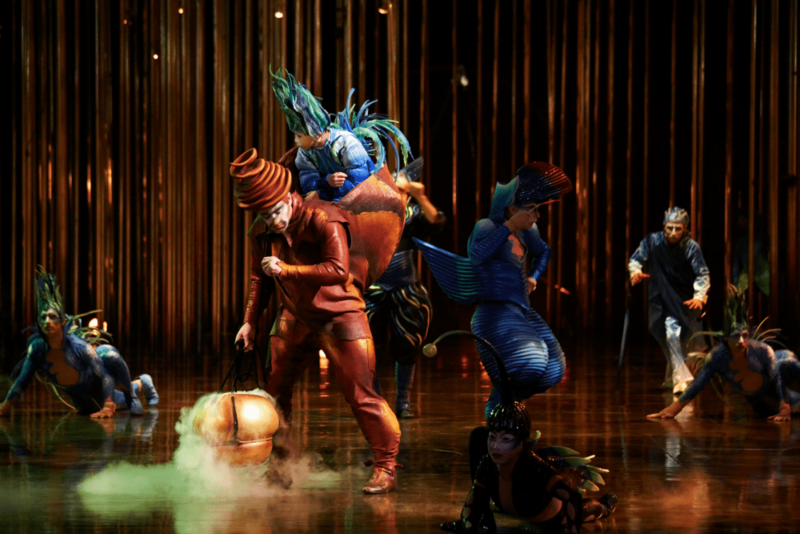 Varekai, which is now playing at Royal Farms Arena, has been seen by nearly 10 million people worldwide since it first premiered in Montreal in 2002, and features an international cast of 50 performers and musicians from 19 different countries. The show begins with the Greek myth of Icarus centering around the story of what happened to Icarus after he flew too close to the sun and fell from the sky. From the aerial straps, hand balancing and Russian trapeze; to the synchronized tumbling, sticks, Russian swings and Georgian dance, my husband and I found ourselves in awe of this production. I continuously found myself wondering exactly how those humans accomplished such amazing feats. And also, THE MUSIC. The music was glorious. 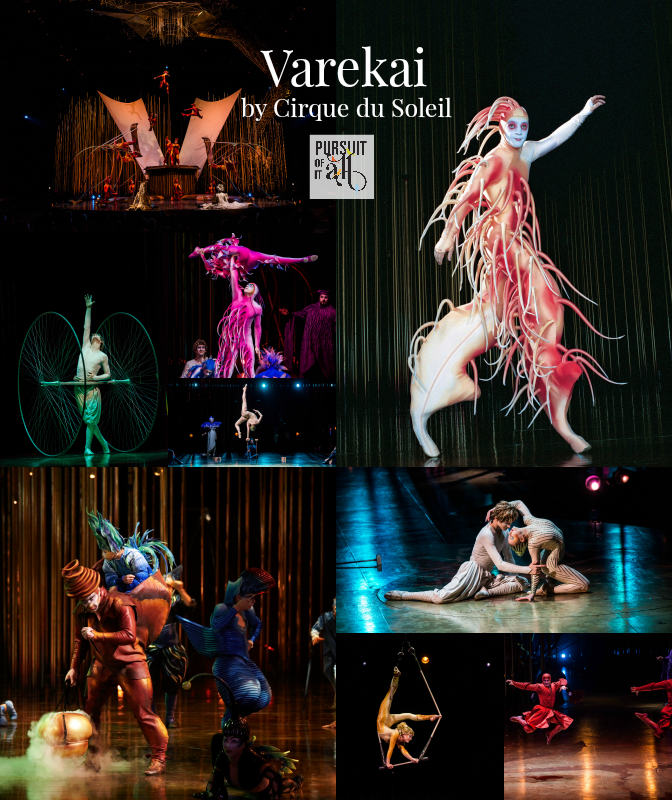 Varekai is at times dramatic, at times beautiful, always mind-boggling, and a little bit of a hey-slug-get-off-the-couch-and-see-what-that-body-can-do wake up call. In all honesty, every Cirque show that I’ve experienced to has been so visually stunning that is has taken my breath away. Verekai was no exception. Costume designer Eiko Ishioka is simply brilliant. Verekai has over 600 costumes, shoes, wigs, hats and accessories. It takes no less than 250 hours a week to keep the upkeep costumes on tour. In fact, their wardrobe team consists of 4 permanent touring staff and 2 local wardrobe employees in each city to launder, repair, iron, repaint the shoes and retouch the hats. The artists’ make-up is so complex that it alone can take between 45 to 90 minutes to apply. And would you believe that each artist is responsible for his or her own? Tip: Parking will run you anywhere from $10 to $20. Skip the overpriced concession stand and go out for drinks at a nearby establishment. You’ll thank me later. Disclosure: I was provided two press tickets for the purpose of this review. All opinions contained are my own.